That link is from late 2011. Thanks Lizzy. I did a 24 hr search and it hit. I hate when they trick us on to their site. I will pay closer attention. My apologies. 30 people? I guess everyone that cares was at the conference. Snark intended. The rally’s purpose was twofold — show community support for Fisher and demonstrate anger toward Keystone Central School District administrators for their handling of Fisher’s situation. You’re welcome. I wasn’t sure what to make of it, though. justice. can only leave cell 1 hr day, shower 3x weekly, no contact with visitors (no hugs…). Is the other shoe ever going to drop? Well, I don’t think Spanier being charged is that shoe, but I guess it can’t be excluded considering the delay and no indictment via Sassano’s work. I am not overly optimistic the shoe that ties a ring together will anytime soon, but I am convinced there is one. It does not help the cause that “B” is being what I would call “cagey” with whatever he knows. Not credible outside of his own accusations, which I believe. Hot damn. Where’s my beloved beejay so I can say affectionately, I told you, lol. But seriously, he absolutely should be, and the efforts of his counsel to stave the inevitable has failed miserably. I have no patience for the entitled elitist. No cake for the people Mr. Spanier. who’s gonna put PPS, Keefer, Porter etc as a joint defendant OR even depose them, and what LE entity is going to investigate with seriousness the school personnel? No wonder PPB offloaded this crime scene like a hot potato. I imagine the PPB union has similar strength, which is why Federal investigation of some system issues came in. 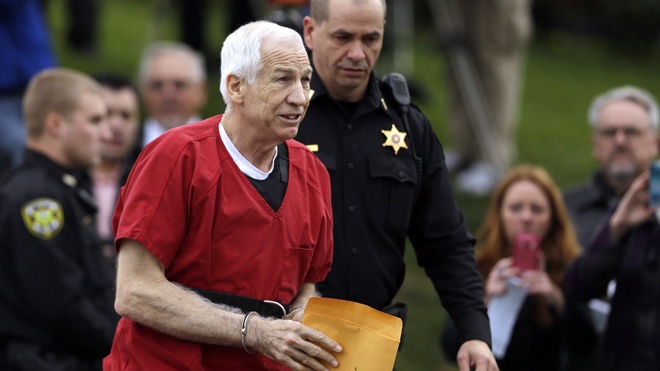 Sandusky situation within an addictive environment like football is problematic in that it introduces the reality of how the game contributes to faulty judgment, in the coverup, in the privilege and allow ant offered to players, and coaches, etc. Despite the fact that money drives it all, in politics, as well as sports, such environments foster a host of social flaws cultivated and fueled by fame and fortune. Sandusky’s appearance revealed that he may have had in diagnosed traumatic brain injury characteristic of former, or current football players, and the inquiry was never reached of whether such persons increase the risk to others in society (even children?) due to faulty judgment that may be expected could arise from traumatic brain injury. Since we have never asked, or researched such problems, we may never know! Pat are you suggesting that traumatic brain injury which he never had, causes pedophilia? and wife can support him.